Q-Dir is a free program for Windows that gives us unique experiences in the file explorer and management. 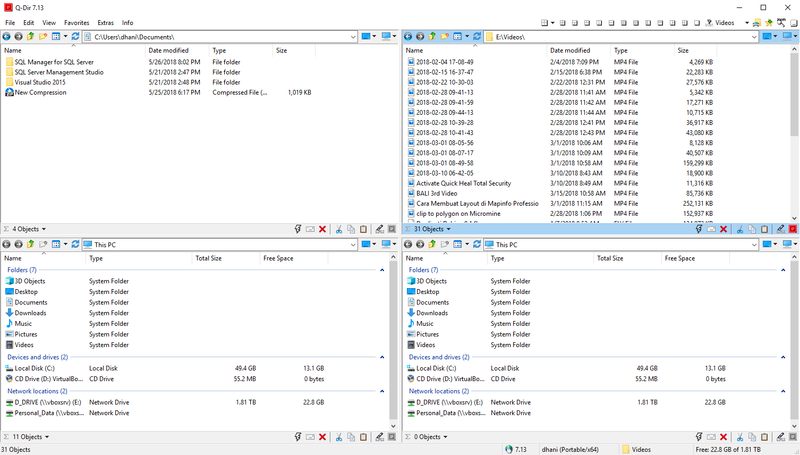 This program displays up to 4 different directory explorer in a single window. We can drag and drop files between the explorer. This program is very helpful when we need to open multiple windows explorer. The problem with Windows Explorer window is that we need to manually switch between windows using Alt+Tab or mouse click. This issue is solved with Q-Dir. The new version of Q-Di 7.13 is now available for download. You can choose the installer or portable version. Both are free. With Q-Dir, you can access your hard disk, network shared folder, USB drive and other storage media you may have. Then, you can transfer between them using drag and drop feature. If you like it, you can even set Q-Dir as your default file/folder browser replacing the Windows Explore. Here are some screenshots of the new Q-Dir 7.13. You can download Q-Dir 7.13 Portable from this link. If you prefer the installer, you can get it here.